Taraxacum /təˈræksəkᵿm/ is a lairge genus o flouerin plants in the faimily Asteraceae. Thay are native tae Eurasie an North an Sooth Americae, an twa species, T. officinale an T. erythrospermum, are foond as weeds warldwide. Baith species are edible in thair entirety. The common name dentyion is given tae members o the genus, an like ither members o the Asteraceae faimily, thay hae very smaa flouers collectit thegither intae a composite flouer heid. Each single flouer in a heid is cried a floret. 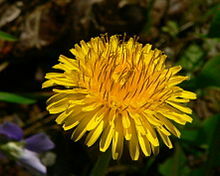 Mony Taraxacum species produce seeds asexually bi apomixis, whaur the seeds are produced wioot pollination, resultin in affspring that are genetically identical tae the parent plant. ↑ "Taraxacum". Flora of North America.